Desires of the Dead was just as good, if not better than the first book in the series, The Body Finder. I apologize in advance because this might be a long post. I tend to gush about the books I find fantastic and Kimberly Derting has created an original and creative spin on paranormals and psychics and that really shines in a market swamped with flat, unoriginal stories. She also has a really great sense of characterization, where each character has their own tangible voice, personality, opinions, and drives. I am a true lover of character development. There can be all the cool plot twists, evil villains, and shoot 'em up scenes you want, but if the characters don't pop off the page screaming their personalities to me, I tend to end the book dissatisfied. SO not the case here. I really really enjoy this series and I am super excited that the next book, The Last Echo, was finally unveiled this last week :)You can check out the blurb on most sites like Amazon and GoodReads. 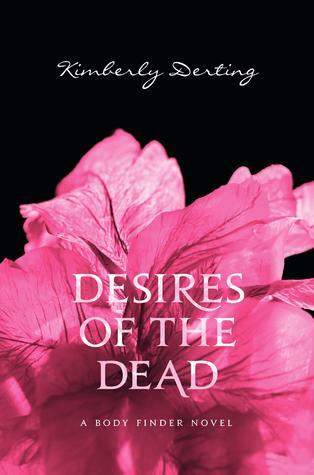 Like the first book, the plot of Desires of the Dead was full of twists, slightly disturbing occurrences, cute and semi-steamy love story-ness, and fun storytelling. Again, you get to see the side of the story through the "murderer's" eyes occasionally, which adds tension and mystery throughout the novel. The emotional and relationship plot was cute, sweet, and believable. I thought Jay's hero worship of Violet's uncle was hilarious and combined with Violet's teasing nature made for a pretty great scene right in the beginning of the book. "Probably not-" Violet answered at the same time. " Desires of the Dead was chock full of funny quotes and awesome scenes. There were only one or two things in the book that kind of bugged me. Violet and Jay's fight seems tad unrealistic. I don't want to give some of the plot away, but they end up having a disagreement over who killed an animal, and because Jay doesn’t believe that the person who Violet accuses would do something like that, they don't speak for like two weeks. Even in high school, I was never pigheaded enough to not talk to someone over having a different idea or opinion than I did, especially if I was having a disagreement with a guy I was in love with. I welcomed the difference in opinion because it gave me that much more insight into his character and life. Plus, there is NO WAY that in high school I could possibly ignore my boyfriend and best friend for more than like...a day. Whereas, Violet looks at her and Jay's disagreement as a huge betrayal, which I thought was rather over-dramatic. Hahah that rhymes... Anyways, I guess I will have to wait and see what happens in The Last Echo. I believe I will give this book 9 Dead Kitty-Cats out of 10. A fantastic book that leaves me wanting more, without leaving an exasperating cliffhanger that drives me nuts. I totally have to read the first book first!!! Lol!!! i'm definitely interested in reading this. i've been getting into books with a psychic theme.